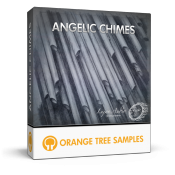 Orange Tree Samples is proud to announce the release of Angelic Chimes, an extensively-sampled struck chimes sample library for Kontakt. Angelic Chimes boasts nearly 10 GB of uncompressed samples, containing six sets of chimes--bass, baritone, tenor, alto, soprano, and sopranino--all available as a single playable range. It also includes three separate mic signals, giving you a great deal of control over the mixing of the chimes.